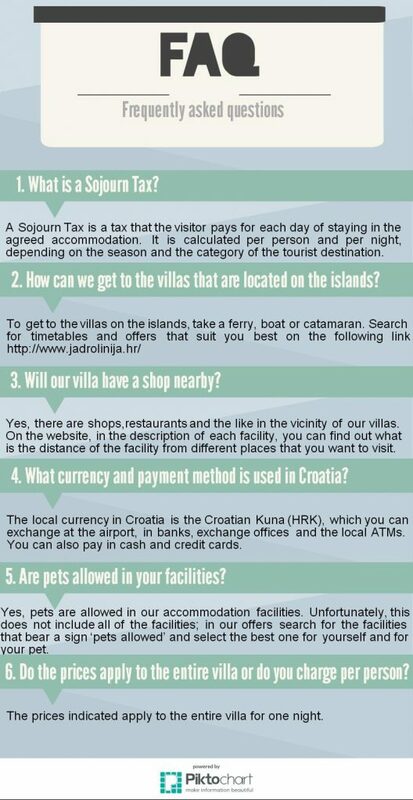 Sojourn Tax is a small amount of tax you have to pay for each day that you stay in our Croatian accommodation. Sojourn Tax is calculated per person, per night, depending on the season and the type of tourist destination, sorted through class A-D. Usually, it ranges from 0.5 Euro to 1 Euro per day. Children under the age of 12 will not have to pay this tax but children from 12 to 18 will pay half the standard rate. How can we get to the villas that are located on islands? There are many transport links throughout Croatia that link the main airports to the various islands throughout Croatia. If you are travelling throughout Croatia, we’d recommend renting a car, but if not then you can travel throughout Croatia and to the islands with public transport. Brac Island and Hvar Island have ferries, taxi boats and catamarans that can transport you. Will our villa have a shop nearby? There are shops and restaurants within close vicinity of our villas. Each villa description will show you how close the nearest shops, beaches, restaurants and city centres are. The local currency in Croatia is the Croatian Kuna, which you can exchange at airports, banks, exchange offices and local ATMs. You will be able to pay with cards throughout Croatia. Most larger supermarkets and restaurants throughout Croatia may accept Euros, but you will likely be given your change in Kuna’s and the exchange rate through this method is rather poor. A lot of our villas accept pets, but this does not include all of the villas. When viewing our villas, there will be a notice displaying whether or not pets are accepted. Alternatively, you can contact us to discuss which of our villas accept pets. Do the prices apply to the entire villa or per person? If you have any more questions about our villas and services, be sure to contact us where we can discuss all your holiday needs and enquiries.